The product with the free mini moisturiser is currently unavailable but the the regular one is in stock. See "you may also like" to the right. With FREE Mini Moisturiser - While Stocks Last! 2 gentle products in 1 handy tube! Cleansing Milk 2 in 1 provides a very gentle face cleanser and make up remover in one tube. 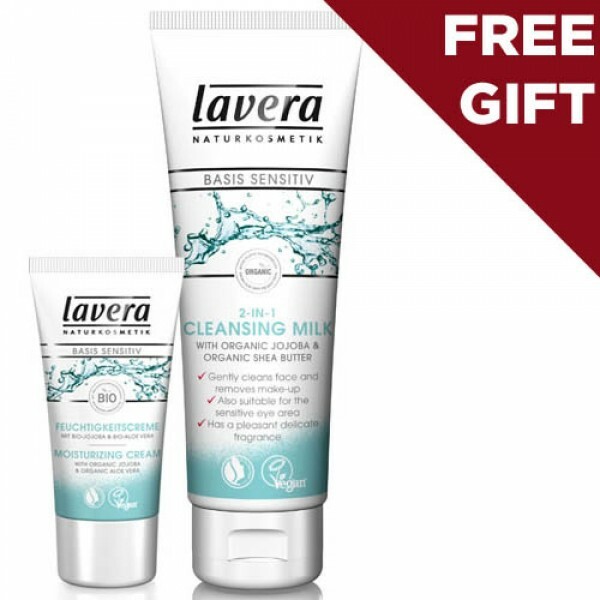 This special offer pack with the inclusion of a FREE Mini moisturiser 7.5ml makes it an ideal travel companion. Best budget buy! This cleansing milk provides a very gentle face cleanser and make up remover in one tube and is especially suitable for the sensitive eye area. Organic jojoba and organic shea butter combine to care for the skin. Apply to the face, neck and lower neckline in the morning and evening. Leave for a few moments before washing off with water, or removing with a muslin flannel or cotton wool.